This small organ of 7 stops was built in 1987, completed in 1988, and dedicated in recital by then organist Linda Buzard. Saint Andrew’s Lutheran Church is the Chapel for ELCA students and faculty at the University of Illinois. 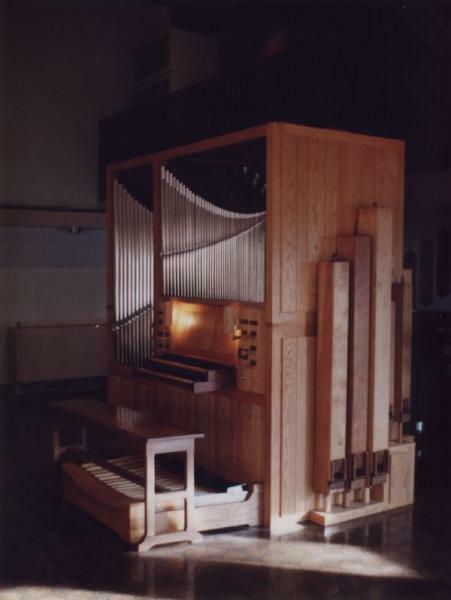 In 1986 St. John’s Catholic Chapel, also on the University of Illinois campus, removed their 1920’s Kilgen organ and donated the usable pipes to St. Andrew’s organbuilding effort. Four sets of these pipes were rebuilt and found their way in one form or another into this instrument. The case was made by the late organbuilder Lawrence Phelps, found in uncompleted condition in a garage in Erie PA, and donated to the St. Andrew’s organ project. The new pipes were made by Organ Supply Industries. The key-actions are balanced mechanical action. The entire organ except the pipes, keyboards and pedalboard, was constructed by Mr. Buzard in a workshop in his Urbana residence with help from the Buzard Company’s first employee David Carhart.